This term Owls will be heading off on some European Adventures. Our writing focus this term is about persuading our readers, so we’ll be producing brochures, advertising and letters. We’ll be starting by boarding a train with our Eurail tickets and travelling across Europe finding out about the mountains and rivers of Europe. Then after that travelling with a partner to a capital city of our choosing. After that we will learn about the different climates found around the continent and what to pack in our bags when travelling. Finally after whizzing through Europe we’ll decide on a country or two to settle down in for the rest of term to learn about. In art we will be looking at different famous European artists and looking to emulate their styles of work. Linked to our writing focus, in DT we will be designing, creating and cooking bread. We are very fortunate this term for people from Drayton Park Golf Club to be coming in and teaching the class golf. At the end of term there will be the opportunity for the class to visit the Golf Club with more information being provided closer to the time. Owls will also be continuing with the daily mile as part of keeping healthy. Welcome to Owls and our brand new fully furbished classroom. 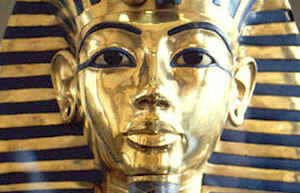 Our topic for term 2 is Ancient Egypt. In Owls we will start of at the beginning of it all, the Egyptian creation story. 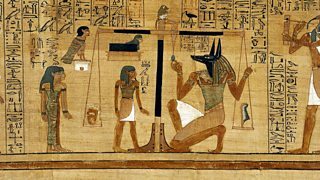 This will introduce us to the amazing Egyptian Gods and Goddesses. Will then turn our attention to the wonderful topic of 'mummification'. What is a mummy? What were they wrapped in? Is it true you got the brain out through the nose? This will all lead on to the children writing an explanation text about mummification. In maths last term we did some super maths looking at place value and going through column addition and subtraction. We'll carry on with this but looking at doing word problems and two-step problems. This will be followed by looking at different methods of written multiplication and division so keep practicing your times tables! Also linked to this we'll be practicing becoming Numeracy Ninjas with our times tables. Everyday the children will have 100 seconds to answer as many questions as possible on the times table of the week. For science we'll be looking at 'State's of Matter'. The children did look over this last year in Red Kites but we'll be going into some greater depth with our learning. Please take a look at our curriculum map if you would like additional information on what we’re covering this term. Hello and welcome back. We hope you’ve had a relaxing holiday and are ready for an exciting year ahead. Unfortunately (as of writing) our brand new classroom is not ready so we’ve set up camp in the hall. 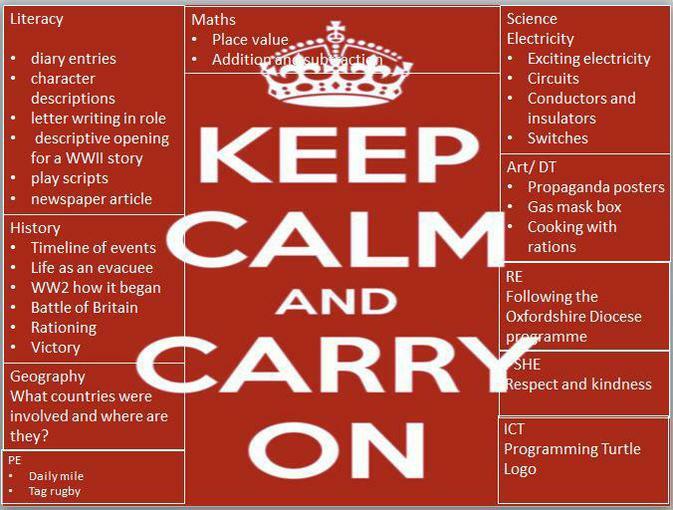 Keeping with our topic we’re going to ‘Keep calm and carry on’. As you may have guessed we’re going to be looking at World War 2 for our topic this term. Our class novel which we’ll be reading from and using as the basis for our writing is ‘Friend or Foe’ by Michael Morpurgo. It follows the life of two boys who are evacuated to the countryside. We’ll be using this to help with imagining what it must have been like living through the war as a child and as an evacuee. In maths we will be looking at place value and using this as the foundation to build upon with addition and subtraction. In science we are going to look at electricity. What is it? Where does it come from? Where do we use it? For art we’ll be looking at using chalk and oil pastels for our Owl artwork and then moving onto creating our own propaganda posters. Every day we will be attempting to do our ‘Daily mile’ where we will be attempting to better ourselves. Our PE lesson will be on a Tuesday afternoon and this term we will be focusing on Tag rugby.